If you have read this blog for a while now, you know that sometimes I throw in a little family story or two. Not because I want to bore you with talk of piano recitals, parent teacher conference and bear lake trips! Heavens no. I just like to write about funny things, and cute things, and things that I might tell one my sisters if she were sitting here next to me. So…with that said. Here’s a sweet little story for your reading pleasure today. I have a little boy named Aaron. He’s just 5 years old, has big brown eyes, thick curling eyelashes and a smile that melts my heart on a daily basis. Several days ago MyHandsomeHusband was cranking out some tunes on our living room piano. He’s the talented kind that can sit down, no music needed and play whatever he just heard on Dancing With The Stars. And not just play it….the man PLLLAAAAYS it with flourish and fanfare, I tell you. On the particular day in question, he happened to be playing The Pink Panther theme. Can you hear it in your mind? It makes the story better if you could hum it to yourself or something. Thanks for your participation.“Dad!!! !” Aaron said. “That is the BEST song ever. I have a great idea. Do you think on Sunday when you play the organ at church you could play that song REALLY loud while everyone walks in. They would LOVE it Dad. I’m not kiddin. They would LOVE it.”And so my friends, my question to you on this cold November day is…would you LOVE to be serenaded with The Pink Panther Theme song while you walk into church this week? I’ll talk to the man of the house and see if he can hop around to a few ward buildings this week. I’m sure he won’t mind. When the Good Lord blesses a person with Pink Panther talent…one is obligated to share. This recipe is for all of you church goin’ folks who like to leave dinner cooking in the Crock Pot while you and your family head off to your meetings to hear The Pink Panther. PS….You can still make this recipe, even if you don’t go to church. 1. Place your pork roast on a pan, or plate. 2. In a small bowl combine the salt, pepper, rubbed sage, and garlic. Press the seasonings into the pork roast. Spray the inside of your crock pot with cooking spray. Place the seasoned pork roast inside and pour the water along the edges of the roast. 3. Cover and cook on low for 4-6 hours, depending on how fast your crock pot cooks things. The internal temperature of the roast reads 180 degrees. 5. Drizzle some of the glaze over the top of the roast and let it cook for another 30 minutes. 6. Remove the roast from the crock pot and let it sit for about 5 minutes. Slice it thinly, drizzle the remaining sauce over the top and your are ready to eat. It’s fabulous served with rice and a green veggie…or with roasted vegetables. the veggies in the picture are due to post tomorrow. Yum!!! Can't wait to try this and I have everything I need for this recipe in my house at this very moment. Thanks for the story and the recipe. This looks yummy! Ok, I'm the type who has to have VERY specific directions for everything…..how did you make those veggies? This looks delicious. I'm always looking for new recipes so I love your blog! I'm hopping over from the blog hop at Miss Mommy. OMG…that is such a sweet story and so glad that you shared it. Maybe more folks would attend church more often if they DID play The Pink Panther ;} Can't wait to try this pork roast…yum! I actually found this recipe on Pinterest a while back, and now it's the ONLY way I make a pork roast. So delicious! Jamie, this looks wonderful! 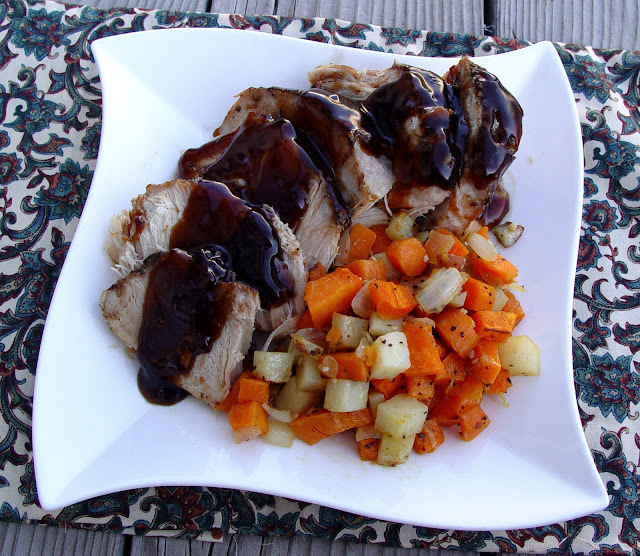 Do you have a recipe for the potatoes and carrots that are pictured with the pork? sorry just saw what you said at the very last. guess i just jumped the gun with excitement! Definitely gonna try this SOON! Yum and I LOVE roasted veggies too! Ha! Love it! Could your husband come to my ward in Pleasant Grove, that would be fantastic (and I'm sure the pork is awesome too)! The recipe for the Roasted Root Vegetables went up today. Good luck! Oh my!! That glaze looks so rich and amazing! 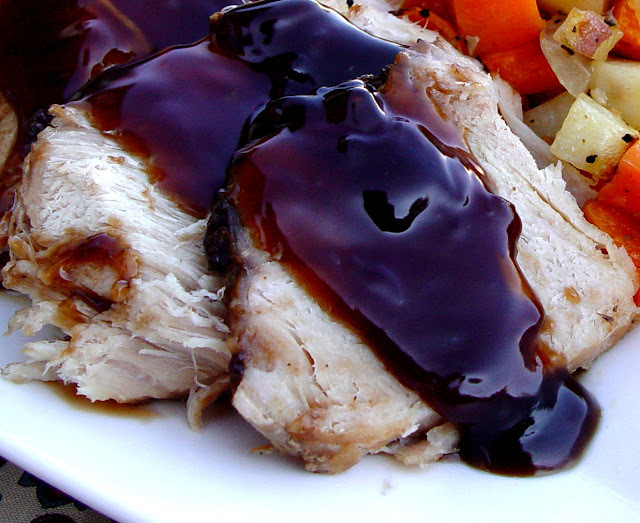 I'm all for sauces and gravies and anything with balsamic in it! Definitely trying this next week. My glaze was not very thick when I checked the recipe on pinterest I noticed that their recipe called for 1 tbls. cornstarch. Is that what you used? Thanks for catching the error. Yes, you are correct it needs 1 Tablespoon. Have a good one. My family all LOVED this recipe! Thanks so much for posting it. My 12-year-old son kept saying that it was “the most epically epic pork of all time”. 🙂 Also really, really loved how easy it was to make. Made this for dinner tonite, via the crockpot, and it was one of the best pork roasts I have ever had. The sauce was to die for. Also made the root veggies and Red Lobster garlic cheese biscuts– what a nice Sunday dinner we had. Everyone raved. Thanks so much for this recipe, it is a keeper for sure. This is the recipe I have been looking for. Thanks for sharing, I can really smell and taste it, it looks so deli! Unfortunately in Germany we are not used to cook with the crockpot so it is very difficult to find good recipes…..but now I know where to look! AGHHHHHHHHHHHHHHHHHHHHHHHHHH !! !< -thats me collapsing in a food coma..love love LOVEEEEE this recipe! huge hit... i used a pork tenderloin and cooked at 425 for abt 30 min a pound..basting in sauce ocassionally but i will try the slow cooker with a pork roast next...FAB>>> U>>>>LOUS!!! YUMMO! thanks again Jamie! This recipe really needs the balsamic vinegar. It just wouldn't be the same without it. It may be best to look for another version of Pork Roast. I made this for last night's dinner and it was just amazing!!!! And it goes so well with the roasted root vegetables….delicious! This is definitely a keeper in my recipe book! Thank you so much for sharing another fabulous recipe! What garlic? Garlic salt? Minced garlic? This looks delicious! What type of garlic? Salt,cloves, etc? Can I just use pork chops for the recipe instead of the whole pork tenderloin ?